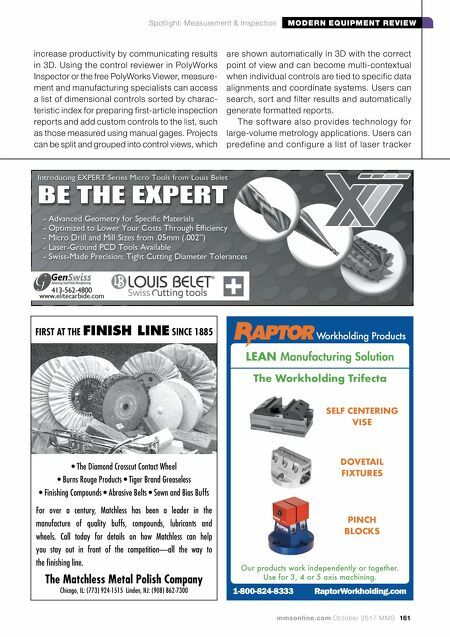 160 MMS October 2017 mmsonline.com MODERN EQUIPMENT REVIEW Spotlight: Measurement & Inspection INSTRUMENT CALIBRATES VARIETY OF INDICATORS Mitutoyo America Corp. announces the release of the i-Checker, an inspection instrument specially designed to calibrate a variet y of indicators, including bore gages, Digimatic indicators, dial indicators, dial test indicators and linear gages. This version is said to be at least twice as accurate as the previous model, achieving an accuracy level of 0.1 + 0.4L/100 microns. At 10 mm/sec., speed is improved 2.5 times compared to the previous model. To reduce operator fatigue, all functions for inspection are in the control box. Measurement position can be easily adjusted via semi- and fully automatic measurement functions, reducing inspection time. Spindle positioning at the inspec- tion points and automatic measurement results enable users to efficiently check digital indicators with data output functions. Users can also create and print simple inspection certificates. Hardware setup requires only plugging in a USB cable. The updated i-Pak software includes the most recent standards for ASME, ISO and JIS. Previous models can be upgraded with new software and controller. Mitutoyo America Corp., call 630-820-9666 or visit mitutoyo.com. 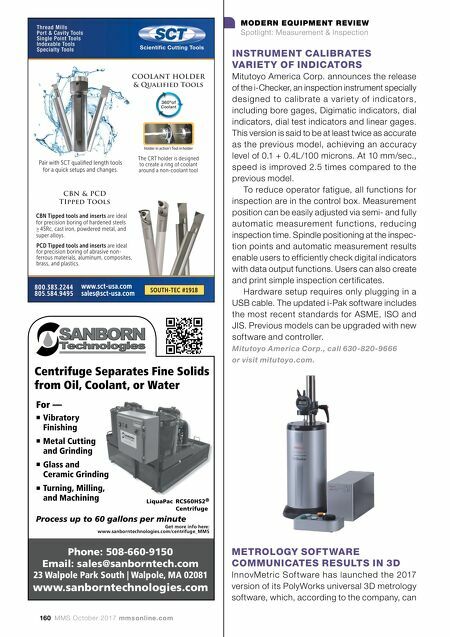 METROLOGY SOFTWARE COMMUNICATES RESULTS IN 3D InnovMetric Sof tware has launched the 2017 version of its PolyWorks universal 3D metrology software, which, according to the company, can Get more info here: www.sanborntechnologies.com/centrifuge_MMS Phone: 508-660-9150 Email: sales@sanborntech.com 23 Walpole Park South | Walpole, MA 02081 www.sanborntechnologies.com 360º of Coolant 800.383.2244 805.584.9495 SOUTH-TEC #1918 www.sct-usa.com sales@sct-usa.com Thread Mills Port & Cavity Tools Single Point Tools Indexable Tools Specialty Tools Scientific Cutting Tools Holder in action \ Tool in holder COOLANT HOLDER & Qualified Tools CBN & PCD TIpped Tools The CRT holder is designed to create a ring of coolant around a non-coolant tool Pair with SCT qualified length tools for a quick setups and changes. CBN Tipped tools and inserts are ideal for precision boring of hardened steels ≥ 45Rc, cast iron, powdered metal, and super alloys. PCD Tipped tools and inserts are ideal for precision boring of abrasive non- ferrous materials, aluminum, composites, brass, and plastics.